Home » Science for everyone » March for Science – Why? March for Science – Why? “Wait a minute, wasn’t it last year?” -asked many, who were surprised to hear, that March for Science – the event which is supposed to bring attention to science in general and especially to earth sciences – is not a one-time thing. Yes, last year it took place for the first time. If you remember, it appeared as the reaction to the agenda of the Trump Administration. There are no alternative facts, there are only scientific-proved evidences, especially about climate change – this was the main message of March for Science organizers. Financial cuts in NASA climate department, quitting the Paris agreement and many more arrangements of that sort were not well accepted by American scientists, and their protests were supported throughout the world. Just recently New York Times reported about Jim Birdenstine, who “has no scientific qualifications to run NASA”, and who is believed to be a climate change denier, to be confirmed on the post of NASA administrator. This shows once again that, until necessary changes are happening, scientists should step up. 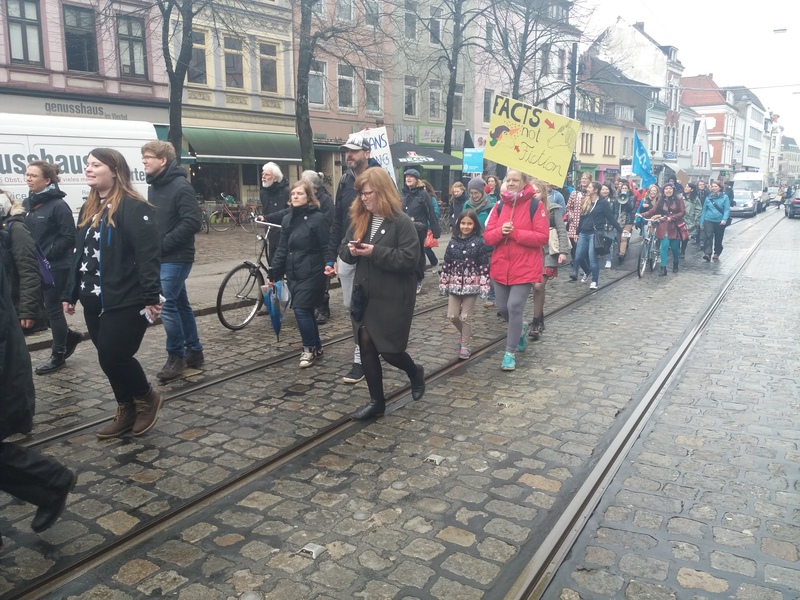 Thus, on the 14th of April 2018 the March for Science took place again in many cities, among them were few German ones: Karlsruhe, Berlin, Freiburg, Göttingen… And Bremen for the first time! For the organisation we should thank Axel Börold and Julia Kreitz, who did a great job, although they had just a couple of weeks for the preparation, since original volunteers stepped down. Due to the rainy weather in Bremen (surprise?!..) the route was shorter than planned and we walked from the central station via Am Dobben, Sielwall, Kunsthalle towards the Marktplatz. 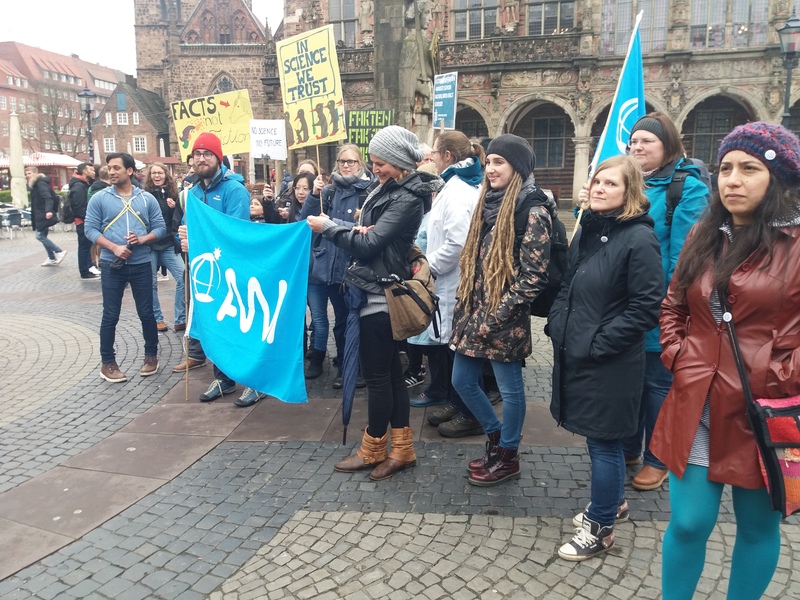 Although not more than 150 people altogether, we marched proudly, chanting ‘Science not Silence’ in several languages and trying to explain people around who we are and what do we want. Right in the beginning of the event, when still at the central station and still in pouring rain, chemist Wolfram Thiemann, who was teaching at the University of Bremen for many years, was trying to clarify exactly this. He was saying that, even though now in Germany the situation is not bad, science is international and we cannot close our eyes on what happens in other countries: how little support do scientists get, financially and socially. Raising awareness, especially nowadays, when the evidence for drastic climate change has never been so unambiguous (please see the latest temperature data from NASA), is what is driving organizers and participants of such events as March for Science. But not only: we are trying to show that science and education is something that should unite and not separate us, that communication is the clue – communication among scientists as well as between scientists, government and public. This is also what drives us, ArcTrain bloggers, isn’t it?